There’s no need to monitor it carefully — a half ham can stay its little hot tub for up to eight hours without any problem, letting you focus on the timing of your side dishes. It’s completely tender, succulent, and juicy, and once it reaches its target temperature, all you have to do is slap on a glaze and pop it under the broiler for a quick crisping. Fill a big tub or bucket with water, set your immersion circulator down in it, and set the temperature to 57C. (You can go as low as 48C, but I like mine a little hotter. Also, though the packaging instructions may say to heat your ham to 73C, this is completely unnecessary; that thing is already cooked.) Remove the outer packaging from your ham, but leave it in its vacuum-sealed bag. Place the ham in the bath. Walk away for at least two and a half hours for a quarter ham, or three hours for a half. 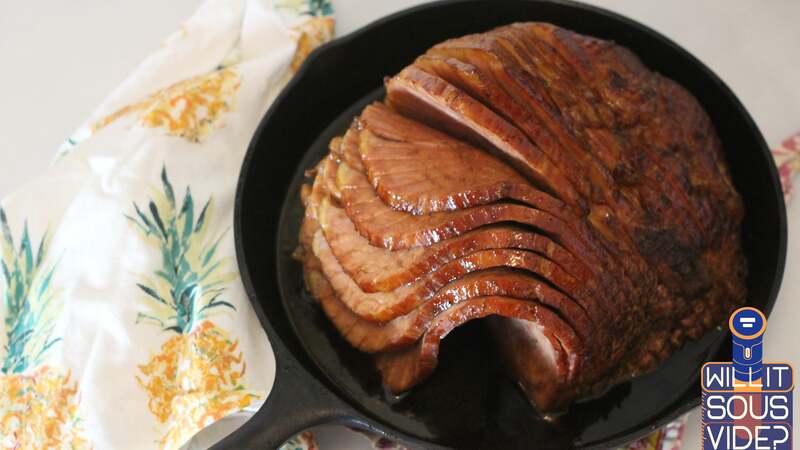 While the ham is cooking, make your glaze by combining all the glaze ingredients in a sauce pan and heating it over medium heat until it reduces into a thick glaze. Once the sous-vide cooking time has elapsed, preheat your broiled and remove the ham from the bag, and set it in a roasting pan or an sort of oven-safe dish that will hold it. Pour the glaze all over the ham, making sure to get in between the slices, then secure the slices against the body of the ham with toothpicks so they don’t fan out — a fanned out slices is a dry slice. Place the glazed ham under the broiler for about 5-10 minutes, until the it’s all shiny and crusted in sweetness. Remove the toothpicks, fan out the slices, and serve.